Birthday cakes, anniversary cakes and celebration cakes in Mount Cotton Brisbane. To order cakes for Mt Cotton area please contact me. 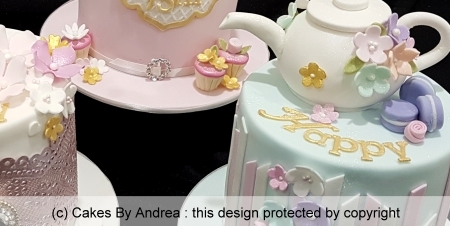 Set of small exquisitely decorated cakes [each 80mm diam]: (1) Pale pink fondant cake topped with hand-made tea cup with rose bud inside, mini cupcakes and embossed name/age plaque on side. (2) White fondant cake featuring hand-made pearlised pink sugar paste lace. (3) Pale blue fondant cake topped with hand-made sugar paste teapot, mini macaroons and irregular stripes around side. Each cake set on fondant covered board and finished with ribbon and matching inscription. Visit the Design Range page to see more birthday, anniversary and special occasion cakes for Mount Cotton Brisbane.